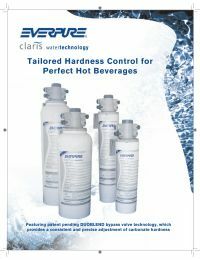 The Claris EV4339-13 water filter cartridge is a new technology tailored to the hot beverage market. The Claris EV4339-13 meets all of your filtration and softening needs in one filter. 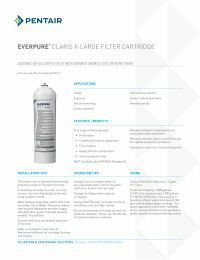 Quality Assurance One year limited warranty on the Claris EV4339-13 water filter from Everpure. 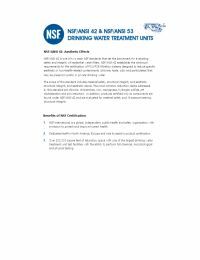 NSF Certified This replacement filter is certified to NSF/ANSI Standards 42 requirements. Perfect Hot Beverages The filter provides coffee with perfect crema, full flavor, and pleasant aroma. Contaminant Reduction. The Claris EV4339-13 filter removes harmful contaminants, unpleasant odors and tastes using a five stage filtration process: prefiltration, carbonate hardness adjustment, fine filtration, highly efficient carbon block, and solid membrane filter. It removes particles down to five 5 micron for maximum efficiency and long service life of your machine. The system uses DuoBlend Bypass Valve technology, which provides a consistent and precise adjustment of carbonate hardness in potable water. The DuoBlend valve helps protect your machine's parts from lime scale deposits and unaffected pressure changes in the water feed supply to ensure high quality water. The Claris EV4339-13 sets a new benchmark in the water filtration market. Better For You & Better For Your Customers. The unique Claris water filter system is engineered for specialty coffee and foodservice markets. Its removal of harmful contaminants, unwanted taste, color and odors from water ensures protection for your customers. The filter combines sophisticated filtration technology with smart engineering excellence which used to be only associated with larger and more expensive systems. The precise combination of scale reduction, while retaining the required level of minerals needed for proper flavor, is the secret to high quality, great tasting hot beverages and ensuring equipment protection at the same time. The Claris water filter system provides your business with cost savings by having reduced down time on equipment and great beverages for retaining your happy and loyal customers. Easy Installation & Replacement. Cartridges are replaced in seconds with a ‘twist off – twist on’ method. Air vent and flush directly at the filter head without any disconnection of tubes. Filter uses no electricity and has vertical or horizontal operating configurations. Typical Applications. The Claris EV4339-13 filter will give you better tea, coffee/expresso, and other hot drinks. It also is used in self-cooking systems, combi steamers, or steam cookers and ovens. 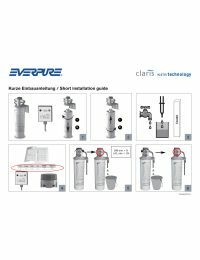 Everpure Claris water treatment systems by Pentair® (excluding replaceable elements) are covered by a limited warranty against defects in material and workmanship for a period of one year after date of purchase. Everpure replaceable elements (filter cartridges and water treatment cartridges) are covered by a limited warranty against defects in material and workmanship for a period of one year after date of purchase. See printed warranty for details. Pentair will provide a copy of the warranty upon request. Pre-filtration media at the entrance to the cartridge retains coarse particles, such as sand or grit. The ion-selective Claris medium reduces carbonate hardness (alkalinity) while retaining other minerals needed for good drink quality. Fine filtration impacts the filter media and removes fine particles from the water. High efficient carbon block filter removes harmful contaminants, unpleasant odors and tastes. Solid membrane type filter removes particles down to 5 µm for the highest equipment protection.